Yes, it is fictitional (that episode, BTW, is hilarious), and always was. 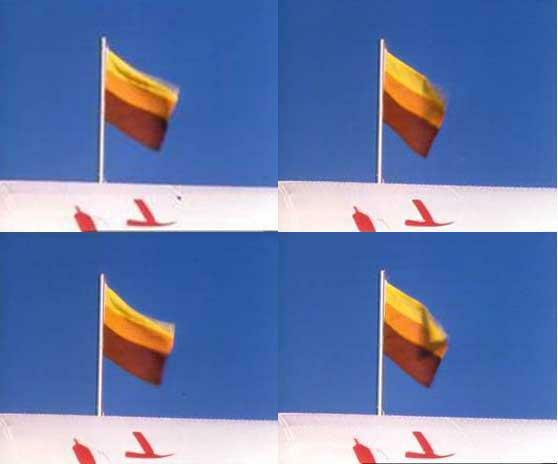 IIRC, I reported this flag to FOTW a long time ago, but if my memory serves me well (and my notes are not utterly wrong), the flag was not red-orange-yellow, but yellow-orange-red. In this screen capture here, the flag that is shown flying above a jet. It appears to be a horizontal triband of yellow at the top, orange in the middle and brown at the base. I do think the bottom stripe is brown rather than red as some of your correspondents have suggested but a somewhat unlikely African colour scheme I think! 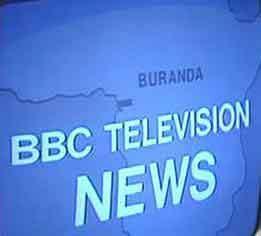 This screen capture here is taken from a news report in the episode in question stating that a coup has occurred in the African state. A map is shown depicting the location of the fictional state. The lower stripe seem to be a tad thicker then the other 2. Note that the map in the episode disagrees with the location shown in the books based on the series, which place it very close to where Ghana actually is.